Summary: Learn how to troubleshoot an overloaded circuit and how to fix a short circuit. If power has been completely cut off to your house, locate the residual current device (RCD) in the consumer unit to see if it has tripped. If so reset it. If this fails to work, call a qualified electrician to diagnose the fault. If houses around you are experiencing a blackout, call the emergency number for your electricity provider. If one of the miniature circuit breakers (MCB) trips, the most likely cause is overloading caused by using too many high-wattage appliances at the same time. Unplug appliances that consume high volumes of electricity, such as lamps, heaters, irons, hair driers and move them onto a different circuit. With power off, check sockets and plugs for loose wires and tighten the connections if necessary. With power off, check the connections in the consumer unit or fuse box. If the problem persists, you may have a short circuit. A short circuit is caused when there is an accidental connection between a bare live wire and a bare neutral wire, or a bare earth wire. The flow of extra current blows a fuse or trips a circuit breaker. Cut off the power supply to the relevant circuit from the consumer unit. Inspect the flex on all appliances that run from the tripped circuit for damage or a melted appearance. Check your outlets and plugs for the smell of burning or discoloration. Check the insulation on the cable and cores for damage. Check that the earth cores are tightly screwed into the earth terminal in the consumer unit. If you need to tighten the connection, make sure you switch off the main on/off switch, disconnecting all circuits. 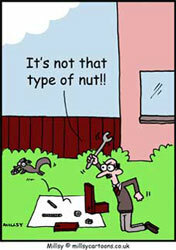 If you cannot locate the fault, call a qualified electrician.